I endeavour to try every product that we stock (where practical!) to have first hand experience of how the product works. Since we stock a number of Evohe’s Sustainable Luxury Skincare products, I felt obliged to try them. Prior to doing so, my skin care routine was non existent – I simply washed my face with water! Having said that, I have tried a lot of skincare products over the years. I had terrible acne in my teenage years, and tried just about everything under the sun (except Roaccutane!! I did try a milder medication). From expensive name brands like Clarins through to multilevel marketing company offerings and everything in between. Skincare was equated with lots of time, effort and discomfort, so when my acne did largely clear up when I was well into my 20s, I abandoned using such products. I started with the Evohe Trial Pack and the Bamboo Face Cloth. The first thing that struck we was the smell… the products smell good enough to eat! I had been experiencing break outs along my jaw line that other things I had tried seemed to just make worse. I found the products in the Trial Pack hydrated my skin nicely without exacerbating my acne. The Bamboo Cloth is wonderfully soft when wet – far nicer on the face than the cotton face cloths I normally use. For the first time, I was enjoying using skin care products, as I really liked the smell and feel of them, and didn’t find them time consuming to apply. So then I decided to try a few other Evohe products to see if I could get on top of the acne break outs that just didn’t want to go away. So I started adding in Exfoliate, the Silica Mask, and Repair Intensive. Evohe Exfoliate has nice large particles in it that do a nice job of exfoliation, and again, one of the best parts is the smell – chocolate! The Silica Mask has become my favourite product – it makes so much difference to my skin that I miss it if I go a few days without using it! Used in combination with Repair Intensive, my acne has settled right down; I no longer get massive breakouts that time of the month, and my staff have commented about how much better my skin looks now. The other things that I like about the Evohe products are that they are Australian made and owned (based in NSW), the bulk of the ingredients (80 – 90%) are certified organic, and that the company adheres to ethical and sustainable practices including using orangutan-friendly palm oil, no animal derived or tested fair trade ingredients. While they are rather pricey as far as skincare products go (though for such high levels of organic ingredients, the price is actually quite reasonable), I find they work far better than more expensive big name (chemical laden!) products. Many of the Evohe products are available in trial size so you can test them out without outlaying much money, and they are quite concentrated formulations so a little goes a long way. 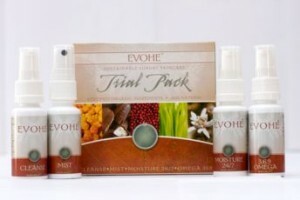 So two thumbs up from me – I highly recommend Evohe products! You do raise a good point about the price of our products so I wanted to explain why some of our products are a little more expensive than many. Most people wouldn’t be aware but Evohe contain highly concentrated, naturopathic grade herbs rather than cosmetic grade which the vast majority of ‘organic’ or ‘all natural’ skincare brands commonly use. As an example, Aloe Vera Juice is commonly used in skincare and cosmetics, and it is often preserved synthetically and not declared as such on products. The ‘spun dried’ method of manufacturing the Aloe Vera powder that we use ensures that no artificial additives need to be used and that all botanical properties remain active in the formulation. We pay approximately $600 per kilo for this powder as opposed to around $35 for the more commonly used, synthetically preserved juice. Thank you again for your great review of our products.